I am getting ready to purchase 16 12 1/4 x 36" indoor stair treads. How much adhesive should I buy? We are going to purchase 13-15 Johnsonite corner guards 1.5in x 1.5in x 4 ft. How much adhesive do we need? I would like to buy two A7141 Robbe Rib Vinyl Stair Treads (12 1/2 x 42) but it doesn't sound like this adhesive would be appropriate for my application. I want to put the treads onto 2 cement steps leading into my house. So this would be an outdoor location. Is there an alternative to this adhesive that seems to be for use in non-moisture setting? Can A408 tread adhesive be used on rubber treads? I am about to buy the A60510 rubber treads, but only need 4. I was looking for something smaller than a whole gallon of the adhesive - which appears to be all the A401 rubber adhesive comes in. The floor accessory adhesive says to put it on approved surfaces. Nowhere does it say what those are. We want to put it on stairs but the stairs are painted. Will it work on the paint or does it need to be bare wood? Thanks. I have installed peel and stick vinyl tiles on my stairs leading to my garage (indoors). I am ordering stair nosing (product A799 and want to find out if the achesive (A408) can be used to glue the nosing to the vinyl tiles (description says for use on wood and concrete). Please advise. Water-based contact adhesive for the interior installation of vinyl stair treads over approved surfaces. Trowelable, water base evaporation cure. 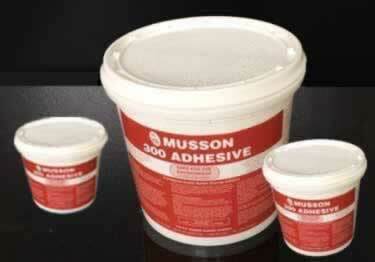 This adhesive has excellent initial grab and long term aged bond strength. I used this adhesive to put vinyl nosing on my laminate stairs. It wasn't really easy to work with it since the vinyl nosings came in rolled shape and when I was putting them on the adhesive applied on the steps, the bumped sections due to vinyl strips being rolled were not adhering to the surface and I had to put something heavy on them. Still not a perfect connection. I did follow the steps shown on the adhesive but I think for this purpose I should have used another adhesive that was fast-setting rather than this item. Thank you for your review. We are sorry for the inconvenience you may have experienced. The adhesive is definitely the right product, we have sold 1000's of quarts and gallons. However, we believe the instructions for the vinyl nosing may have said to leave it out over night to allow it to flatten before installing. That may have been the real cause. If we can be of further assistance or you would like us to send you another quart of glue at our cost, please let us know. The site had this listed as a suggested product to attach the chair molding I had purchased, so I bought a quart. I am a facility manager, but I have never installed chair rails with glue before. When all the materials came in, and I was getting ready to install the rails, I read the side of the container and I saw no mention of wall applications; only stair treads and that made me nervous enough to call Koffler's customer service number for guidance. The guy that answered was so helpful that he even called the company that they get the glue from to be sure he was advising me correctly. The glue works like contact cement (on steroids) and my fear that gravity would slide the chair rail sections down the wall before the glue cured was unfounded. The stuff worked great. This adhesive worked well with my project. Customer service wasn't to good with this purchase. They did move quickly only after I made a call to them to inquire where my order was. This worked great, easy to apply no mess and is holding tight. I received and installed my rubber nose treads, I made a huge mistake by not getting the recommended glue. Within a week of finishing my staircase upgrade, my treads were coming loose. The contractor grade tube glue I used was flaking off from under the treads and it was a mess. I went straight to the Koffler website and ordered the mid-sized musson 300 adhesive. When it arrived I pulled up the treads, flaked the remaining glue off and reapplied the treads. They haven't been a problem since I did it with the right stuff. About a week ago i installed the light vinyl stair treads on 3/4 plywood steps. Mine are 36 inch wide by 9- 5/8 inch deep. They have a curled nose that seats on the nose of the tread. Applied adhesive to the wood treads and the underside of the vinyl with a brush. Fairly thin coat. It took 1 and 1/4 quarts to coat everything. Waited about 30 minutes and then applied. A little tricky since as soon as the treads touch the tread it sticks like a magnet! After the first 2-3 I got the hang of it. Touch the rear edge to the back of the tread and then smooth down back to front and work the lip under the nose. Huge difference! They feel great, look good and don't move at all. This is a great product. I highly recommend it. I ordered the light vinyl stair treads for my basement and attic stairs. Although I ordered the light version (versus medium or heavy gauge)the treads are an excellent value for the price charged. They are superior to the treads that you can buy at the local big box stores. Customer Service was very helpful in getting my invoice corrected as well. Have done business with this company in the past and obviously would do so in the future. I have only installed two of the seven steps and it was really easy. The glue is practically odor free. After three days the glue still hasn't fully set. Is this normal or should I try and stir the glue more. Happy with the product, though. adhesive, no odor, worked great. Thank you Koffler.